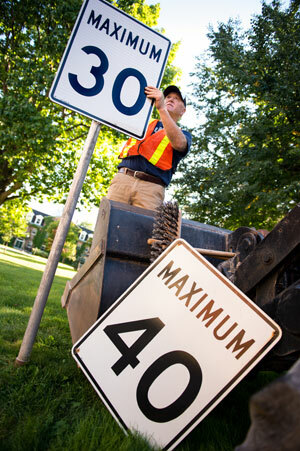 As it attempts to create an environment more conducive to walking and other forms of alternative transportation, the University of New Brunswick has changed the posted speed limit on its Fredericton campus. University officials say the reduction from 40km/hr to 30km/hr is designed to further protect the thousands of students, staff, faculty, and guests who use the campus each day. "Many of our parking lots are on the perimeter of campus," says Bruce Rogerson, director of security traffic at UNB. "That means that many students, staff, and visitors who drive here become pedestrians once they’re on campus." Rogerson points to the approximately 10,000 students from UNB and neighbouring St. Thomas University – 2000 of whom live directly on campus - as further evidence of the volume of pedestrian traffic on the Fredericton campus. "We want people to feel safe as they make their way around UNB," adds Rogerson. "The campus sometimes gets used by motorists as a short cut through the city, so our goal is to slow down the pace of this traffic through our pedestrian-friendly campus." UNB is private property and, as such, has the right to make regulations to ensure the safety and security of people who use its campuses. This change to its speed limit places UNB in line with the normally accepted school zone limit of 30km/hr.